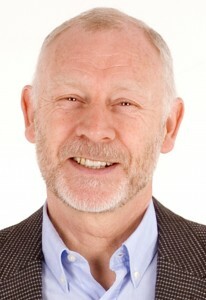 I’m MARK HAYSOM and what you are about to read are the opening chapters of LOVE, LOVE ME DO, my debut novel, published by Piatkus in paperback and Kindle editions. It was like a clock going slowly tick . . . tick . . . tick . . . tick … tick . . . Baxter could hear it now and he could feel it ticking not just in his head but somehow too inside his stomach as he lay in the grey light of dawn, hot and sleepless in the narrow tousled bench bed at the back of the cramped caravan. It was more like when you turned a key slowly in a clockwork toy and you could feel it getting tighter and tighter and you knew that if you kept turning it around it would break but you still did it anyway and it made you feel as if at any moment something really bad was going to happen. It was like that and the clock thing both together and it was a nervous sick thing in your stomach as if you were empty and sick both at the same time. The ticking had started inside him and the empty sick feeling had begun as soon as she said it. ‘It will be good, you’ll see, Baxter,’ she’d said, sitting in the sunshine on the low step of the caravan one afternoon. She was peeling potatoes, sending them plopping one by one into a saucepan of water. From the caravan had come the muffled sound of the radio; Buddy Holly gave way to Ray Charles. ‘Oh, this is one of my favourites,’ she said with a small distant smile. He had wanted her to look up at him, not think about music. But when finally she did look he had twisted away. And the ticking had started and the sickness and the clockwork key thing had turned tighter. Like that time, Baxter thought, that time with the stupid tin soldier with the stupid drum and the key turned so tight it wouldn’t work any more and he, he had yelled at him and Megan had cried even though she was nine and then he had gone slamming out through the door and it wasn’t Baxter’s fault. Not really. ‘Just boys together, you and your dad,’ she said, gouging an ugly black bruise from a potato, sending it tumbling into the pan. But, Mummy . . .’ Baxter started to say. But it was no good; she wouldn’t listen. Again she had smiled, but it was a funny smile as if she didn’t believe it. Not really. Baxter had stood there, angrily swishing a favourite stick backwards and forwards through the long grass. As he scythed at the grass, he could see their small white terrace house in Brighton on the road that ran so steeply, so narrowly, down to the sea and he was back in his room with his train set spread out on the floor and downstairs his mother was singing along to Helen Shapiro or Brenda Lee on the radio and Megan was laughing. But even though they seemed all happy and everything, he knew that really they were just waiting for the sound of the front gate. Waiting for that click of the gate. It was always the same. Whatever else was happening in the house, whatever game they were playing or song they were singing, he knew that it was all just a kind of pretend. What was really happening was that they were waiting and listening. And sometimes it was all right. Sometimes when his father came through the door he had presents for them and everything was happy. For a while. But most times it wasn’t like that. Most times. Baxter stopped swishing, took the stick in both hands and bent it until it snapped. It was days ago that she had said about boys together and the clock and the stomach-ache sick thing had been going ever since and the key had turned inside him almost until it was breaking. And it wasn’t fair and now in only a few hours his father would be there. Just him and his father. As he lay listening to the faraway call of a wood pigeon, Baxter writhed with the injustice of it all. Irritably, hotly, he kicked the crumpled sheet from his legs. He didn’t want to go, he wasn’t going. His father could take Megan instead, she was nine, she was the oldest by a whole year. He should take her: she was the favourite anyway. He wasn’t going. They couldn’t make him. And when his mother and Megan and the baby were up and dressed, he would tell her that he had been thinking about it for a long time and he had decided something. ‘Why’s that, my best boy?’ his mother would say softly, with her eyes big. ‘I just don’t think it’s fair on Megan,’ he would say, and he would probably say this bit really slowly to make it sound even more serious, as if he really had been thinking about it very hard for a very long time. And if that didn’t work he would say he was sick and couldn’t go. And, if they still tried to make him, he would just run away into the woods and hide there all day with Soldier and they would build a camp together. With a mother’s unbreakable habit, Christie listened to the children’s breathing: Megan in her deep untroubled sleep, the baby mercifully quiet in the carry-cot on the floor next to her, Baxter awake and sighing, restlessly kicking the sheets from his legs. Lying on her cramped makeshift bed, Christie propped herself up on her elbows and whispered to him. He sighed again; but said nothing. Taking care not to knock the baby’s cot, Christie swung her legs from her bed and negotiated on tiptoes the few feet of the confined space of the caravan. She bent over, put her head close to his. ‘It’s all right,’ she said, straightening his blanket, smoothing his sheet. ‘In just a word or two, Mark Haysom seems able to evoke the pain of a deserted parent or the fear of a little boy’ (We Love This Book). LOVE, LOVE ME DO – click to buy it now from just £5.99p! She bent again and felt the warmth of his forehead on her lips as she kissed him. Making her way back to her bed, she listened once more. The sighing had stopped. All the children were sleeping now. It had been a stupid idea anyway; another fantasy. Somehow Christie had managed to convince herself that what Baxter and his father needed was to spend time together, just the two of them; to really get to know each other. For too long they had been locked in this unbearable cycle of anger and tears. Truman had no patience with the boy, he was a storm always waiting to erupt; and Baxter was so clumsy and tongue-tied whenever he was with him. The more anxious he became, the more that seemed to fuel Truman’s rage. And that, of course, made Baxter more desperate still. It had never been quite the same with Megan. With her, Truman’s anger would soon subside and he would scoop her into his arms and make her laugh even as she cried. Sometimes Christie could see in Baxter’s eyes that all he wanted was for his father to pick him up and hold him close. What he wanted to hear was his father’s voice making him laugh. What he needed to feel was his father’s arms about him. Instead what he so often heard were more harsh words and what he felt was the weight of his father’s hand: a bruising wallop across the legs or the backside or a stinging cuff around the ear. Christie drew some small comfort that at least it had never been more than that. She was certain that Truman would never, could never really hurt his own son. He wasn’t capable of it. And she, more than anyone, should know just what he was and wasn’t capable of. But it was too much to bear to see Baxter so unhappy. Since they had been at the caravan, Baxter had taken to disappearing into the woods or hiding in the long grass as soon as he heard his father’s car approaching. It couldn’t go on like this and the more Christie had thought about it, the more she had convinced herself that all they needed, father and son, was some time together. She was sure they would then grow close. She had this picture in her mind of herself as a child of about Baxter’s age, standing next to her own father. She was looking on as he worked in the musty warmth of the potting shed, with the rich honeyed smell of his pipe tobacco wrapping itself around them. There was not a word spoken between them, it was enough just to be there. That was what she had wanted for Baxter. A child needed a father, she had told herself, a son especially so. But it had all been another of her fantasies, another fairy story where everything would somehow come right in the end. Instead of a happy ending, all she had succeeded in doing was to give Baxter days of torment. She had seen it in his face, in the anger and the hurt in his eyes. Hunched over a battered, blackened kettle as it steamed on the glowing embers of his early-morning fire, Soldier let the tears run down his cheeks and gather in the clumped grey tangle of his beard. He could taste their bitter saltiness. Tiredness, like an ache, washed over him; it had been another night of little sleep. Once more he had been too full of them: her and the children. All night they had run and played inside his head, the careful, serious boy, the teasing ponytailed girl, the mother in her blue-and-white print dress, with her coal-black hair. Sleep had come only fitfully. They had been in his dreams and in his waking thoughts. Shivering now in the thin pale light of the summer dawn, Soldier pulled his long dark coat more tightly about him. Worn shiny and thin, muddied, stained and torn, it hung from his shoulders like a tattered cape. He warmed his hands over the fire, straightened a little to ease the stiffness in his back. Still the tears continued to run. It seemed as if an inexhaustible well had been opened up in him. The first time had been on a February morning. Half-starved, he had reeled and stumbled through the numbing, knee-high, glistening white drifts. The cold had drilled into him as never before. It had reduced him, worn him away, and made him desperate to seek out the warmth that it had been impossible for him to create for himself in his shelter in the woods. On the doorstep of her cottage there had been no words spoken; just a contemptuous glare and the door left open. After he had followed her shuffling footsteps through to the kitchen, she had stabbed at the headline in the Daily Express in accusation. As if he was to blame. It was the ‘Big Freeze’, she said; the worst winter for nearly three hundred years. He had no cause to be out in it. Soldier had turned away, shame-faced, guilty. All the way to the cottage the black dog had run beside him, its tongue lolling from its mouth, its breath misty in the biting cold. Soldier had looked to the door. ‘That dog of yours again?’ Mrs Chadney said, reading his mind, scorn rising in her voice. Soldier had nodded and pointed urgently to the door. The dog was left outside in the snow. She had struck a match to light the gas ring. Soldier heard the whimper at the door. She came over to him, jabbed at his head with a bent finger. As the pan simmered on the hob, her anger had rumbled on. But she had fed him. ‘Eat it,’ she said, rattling the plate down on the table in front of him, the harshness of her words at odds with her soft Sussex burr. The rabbit stew and dumplings had steamed in front of him. And Soldier had wept. Exhausted tears. Tears of mute gratitude. Soldier warmed his hands again, rubbed them vigorously together over the fire, and then shifted his position to free the ache in his knee. Finally, he wiped at his tears with the frayed cuff of his coat. Still they came. After that first time, it had seemed as if there was no stemming them. Later that same day, making his way back to his shelter, he had thrown his head back and cried with elation at the crisp brilliance of a clear blue winter sky. Then, as the March thaw had finally set in, he had wept as the birds had tentatively started to find their voices once more. He had cried too one morning at the sudden return of the yielding softness of the forest floor. And much later, he had cried at the first sight of her, alone on the caravan step as the evening had settled about her and as the night had gathered her in. The kettle had finally boiled and Soldier reached for his mug. Army-issued, somehow it had survived all the years in the forest with him. Cupping it carefully in his hands, he closed his eyes and tried to summon up the memory that it held. He was half lying, half crouching in a shallow hole ripped from a rolling meadow. Above him the air thundered and sang. Thundered. Sang. His uniform weighed him down, thick and heavy. His hands were blackened and bruised. He touched his face. There was blood now on his fingers. The mug had been left behind by someone else and it was standing half full when he found it; the water was gritty and warm. He gulped it down, it spilled over his chin and he wiped it quickly away with his arm. He was still thirsty, his mouth still dry. The sleeve of his jacket had a jagged tear, threads stood out in coarse tufts. He decided to claim the mug for himself and stuffed it into his kit bag. He was tired, too tired to move. There was a muffled shout in the far distance. He braced himself, breathed deeply, looked up: there were white clouds scudding across a blue sky above. And then nothing. It was no good, he could get no further. Every time he held the mug and closed his eyes, it was the same. There was only blackness before; blackness after. Chipped and veined as it was, he treasured the mug; it was his only possession that held even this much of a fragment of memory. He owned little else. An ancient pair of Taylor Hobson field-glasses, the kettle, a pair of dented saucepans with their Bakelite handles long gone, an army knife, rusted and pitted now, and the few blankets and clothes that Mrs Chadney had thrown his way over the years. Soldier reached into his coat pocket and pulled out a handful of the leaves that he had collected the previous evening. He worked them carefully to the bottom of the mug and poured the water from the kettle. Waiting for his nettle tea to brew and to cool, he squatted beside the fire, pushed his long thin grey hair from his face and scratched at his matted beard. Picking the mug up, he blew at the slicked surface of the muddy green water and took a gurgling sip. Close by he heard a wood pigeon’s echoing call. A first weak shaft of sunlight broke through the canopy of the trees above. The day was beginning, the day the boy had spoken of. Suddenly Soldier’s heart raced. He swallowed the tea noisily and threw the dregs on to the fire. Christie couldn’t settle. The bed was too hard, too ridiculously narrow; it was yet another day to be spent in this hot ugly caravan in the middle of a wood in the middle of nowhere; she was worried about Baxter, about Megan, about the baby. And all night her head had ached with the same questions that she had now spent weeks asking herself. How had she ended up here? With a husband she so rarely saw and little more than the clothes that she and the children stood up in. How had she, that young girl of not that many years ago, with her head so full of dreams and possibilities, come to be living in such a place? How had any of it happened? How had she allowed it to happen? Truman had told them that it was a surprise holiday. Turning up unexpectedly one June afternoon, he had come bursting through the door with his lopsided foolish smile, clutching a big battered leather suitcase to his chest. And he’d never come home early before, not even for the children’s birthdays. ‘Come on, kids, get packed quick!’ he shouted. ‘A wonderful debut about love, betrayal, family and childhood’ (The Sun). 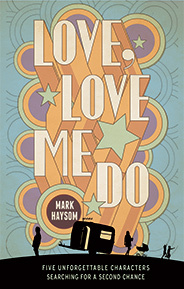 Mark Haysom’s LOVE, LOVE ME DO – click to buy it now from just £5.99p! ‘But Truman . . .’ she said. And now, in the half-light of the breaking day, alone in her bed in the caravan, she couldn’t believe that she could have been so naïve, so gullible. ‘Of course we can, princess,’ he said, and he’d thrown the suitcase on to the kitchen table and had swept her up and twirled her around and the children had laughed. And even though she could smell the drink on him, she had felt for a moment like a girl again in his arms. ‘But where are we going?’ she said. ‘You’ll see . . .’ he said mysteriously, tapping his nose with a nicotined forefinger, winking like a pantomime conspirator. ‘But what about the children’s school?’ she said. ‘Won’t do them any harm, will it? To miss a few weeks,’ he said to squeals of approval from Megan and Baxter. ‘But you’ve never even mentioned a holiday before?’ she said, unsure and breathless as she ran upstairs after him, the children excitedly jostling behind. And he never had, not in their ten years together, not even a honeymoon. ‘Met a man in a pub,’ he said, as if that was all the explanation needed. ‘And . . .?’ she said. Foolishly, madly, she had thrown as many clothes into the suitcase as she could for herself and for the children. She’d then emptied the contents of the larder into a cardboard box and hurriedly packed another bag with the baby’s things. He, meanwhile, had gone to the top of the wardrobe and taken down his own smaller suitcase, the one he’d been carrying when she went to meet him at the station when he came back from National Service, and he had deftly folded his spare suit and his freshly ironed shirts and fitted them neatly inside. Just a few minutes after the allotted fifteen, all the windows had been closed, the back door had been checked, the gate had clicked shut behind them and they were gone. In the car, as they made their way up through Seven Dials and past the grand houses of Dyke Road Avenue towards the rolling South Downs, they’d sung ‘We’re All Going on a Summer Holiday’. And they’d never sung in the car before. It was magical; it was how a family was meant to be. But then suddenly and without warning he had stopped singing. And then he shouted at the children to be quiet. When, still bubbling over with laughter and excitement, they didn’t stop at once he swung round in his seat while he was still driving and with his left hand he swiped at them, missing Megan but clipping Baxter hard on the head. The boy had cried and he’d shouted at him again. And then Baxter had felt ill and Truman had bellowed at him not to be sick on his leather car seats and they had to pull over. After that they had driven north and inland in a silence broken only by the baby’s occasional fretful sobs. Under gathering clouds they had crossed the great green swell of the Downs and then gone on through tree-lined twisting country lanes, canopied with branches so heavy with leaves that they met from either side and formed a darkly dappled tunnel, the day’s weak sunlight struggling to find a way through. Christie had shivered, suddenly cold, and held the baby tightly to her. The tide of exhilaration that had swept her up and along and into the car had long since passed and she had a sense now that something had happened that she didn’t understand, that something was terribly wrong. ‘Is everything all right, Truman?’ she asked, her voice lowered to prevent the children from hearing. He either hadn’t heard or he had chosen not to answer and she hadn’t wanted to risk provoking him by asking again. She had to take care. She always had to take care. They had driven on in silence and Christie had found her mind turning to more immediate concerns. How long would they be travelling? Where and when would they stop to feed the children? How long would they be away? Had she packed everything they would need? Where were they going? She could stay silent no longer. ‘Truman . . .?’ she started to say. But at that moment they turned abruptly from the road and followed a narrow potholed track through densely overhanging trees and nettled verges until finally they emerged into a large clearing in the woods. In the middle of the clearing, squatting in the tall grass, was a small grey-white caravan. ‘Where are we?’ Christie asked in a whisper. ‘We’re in the forest, of course,’ he said as if she was stupid, as if she should have known. ‘It’s the Ashdown Forest and they call this place Tabell Ghyll,’ he said proudly, showing it to them like an enthusiastic tour guide with his outstretched hand. Soldier pushed on through the glossy, waist-high bracken, he pushed on to where the track neared its end, to where it widened and the bracken thinned, to where the splintered branches of a fallen oak lay like bleached bones. There he stopped, he swayed; he almost buckled, almost fell. The pain raged in his knee. He could feel the accumulating shortness of his breath, the quickening beat of his heart. He leaned forwards, bent double and tried to steady himself, to collect himself. He allowed his eyes to close, to rest. A minute passed. More. Finally he straightened and pressed on once more to where the dark edge of the wood met the clearing. There, beneath the spreading shadows of the beech trees, he crouched low in the warm earthy tangle of the brambles, the ferns and the scrubby gorse. Easing his legs from under him, he sat back against the trunk of a tree and looked out across the grassy clearing to where the hunched caravan stood like a small white ship adrift on a swaying sea of green. And there he began to wait and to watch. For so many years Soldier had thought of these woods as his alone. Now, though, he shared them willingly with her and the children. When he had first come across the caravan, there in the woods, his woods, he had immediately wanted it gone. It had no place there, no right to be there. Studying it suspiciously, apprehensively, from the shadowed edge of the clearing, he had been confused. Outraged. Afraid. Diminished. Hurt. But then she had stepped hesitantly through the caravan’s door and had sat quickly down on the low step. In the evening’s fading light, her eyes had nervously scanned the clearing. Settling back against the door, her shoulders had slumped and she had hung her head. Soldier had shrunk back into the brambled margins of the wood, had squatted low and watched. Barely breathing. His lips working on the words that ran through his mind. Over and again. She didn’t want to be there. And that had been enough. In that moment he had known it. That it was his duty. There had been no choice, no decision to be made; it was his duty to keep them safe. Lest violence and harm should come to them. He had known that it was for him to be their guardian angel. A grizzled angel in a stained and tattered long dark coat. She didn’t belong there. She didn’t want to be there. She was afraid. As the last light drained from the day and a cool evening breeze whispered through the long grass, he had stooped lower in the musky ferns that fringed the clearing and he had begun to watch. To watch over her, her and the children. And he had watched faithfully. For hour after hour. From dawn to dusk and beyond. Day after day. And then later the boy had come to him and they had sat together on the rough flint wall. He had built the wall far into the woods some years before, when a thought had settled on him that he should have a cottage of stone to replace his lean-to wooden shelter. And, although the thought had soon faded, had quickly been taken from him, the short length of flint wall had stubbornly remained. Soldier had hoisted himself up next to him, next to the boy. They had sat there swinging their legs, the two of them, knocking their heels against the coarse stonework. And, just for a moment, it had felt to Soldier as if he was a child again, sitting on a wall, somewhere else, with someone else, a very long time before. He was a child again, sitting on a wall, and the sun’s heavy warmth was on his back and there was a blue carefree sky above his head and a lingering low stirring of a breeze on his face. Green fields rolled away from him like the sea and somewhere in the distance a dog was barking and a lark was serenading high above a scented billowing hedgerow . . .
For as long as he could, Soldier had held fast to this splinter of a memory. But as he had reached towards it, to try to understand it more fully, to know it for what it truly was, it had broken down, disintegrated. ‘LOVE, LOVE ME DO is funny and heartbreaking’ (Good Housekeeping). One traumatic day for Baxter. CLICK to buy it now from just £5.99p! He had knocked his heels harder against the wall, trying to reassemble it in his mind, trying to summon up the warmth of the sun on his back, the breeze on his face and the distant barking of the dog. But it was no good; it was gone. It had run through his fingers like dust. And, as the boy had looked on with a silent question in his eyes, Soldier had quickly wiped away a solitary tear. It had been a shrieking animal cry in the shadowy darkness two weeks after they had arrived in the forest that had first set Christie’s mind racing. It had been harmless, of course; she had quickly realised that there had been nothing to fear. But the sound had cut through her sleep and made its way murderously into her dreams. Her eyes had snapped open and in the long moments that followed, Christie had found herself lying rigid, with her hand clasped to her mouth in disbelief. Her heart pounding, her senses stretched, she had waited for the cry to come again. Megan’s sudden whisper had made her heart jolt once more. ‘What was that, Mummy?’ she said. The fear evident in the smallness of her voice. Christie had gone to her and tucked her more securely in. Until Megan was asleep again, Christie had perched on the side of her bed. Finally she had been convinced that silence had settled back on the forest; although she had learned in those first weeks that it was never a true silence, there was always something scratching, something snuffling, rustling, whirring somewhere in the night. When she had been sure that she and the children were safe and that Megan was sleeping, she had given a small bewildered shake of her head. What on earth was she doing in such a place? How had she come to this? It was not the first time she had asked herself such questions. Before, though, it had been easy enough to shake them quickly off: Megan, Baxter and the baby had filled every moment of her days and tiredness had sent her tumbling into sleep at night. But this time it had been different. In the weeks that had followed, the questions she had begun to ask herself in the dead of that night had taken an exhausting hold on her. How had she allowed it to happen? To the children? To her? Whether she was sitting on the caravan step as the sun dipped or whether she was trying to settle back on the absurdly narrow bench bed, resting her head on the cushion that doubled as a pillow, pulling the worn, fusty eiderdown up tightly to her chin, wherever she was, Christie would close her eyes and would find herself instantly plunged back into trying to make sense of it all. The more she had tried to wrestle with it over the weeks, the more a piecemeal jumble of memories had come to her. Oddly, each of them had begun in the same way. Whenever she closed her eyes, the first thing she would see would be a tiny smudged black-and-white snapshot, like one of those she used to take with the old Box Brownie camera her father had given her for her twelfth birthday. Some of these snapshots were fading, some dog-eared and yellowing, some crisp and new. Gradually the image on the photograph would come into focus. There would be a face smiling or her bicycle propped against the cobbled school wall or a child running or the stretched sun setting on a spangled sea. At first, as the picture began to emerge, Christie had gone diving recklessly into the memory. In time, though, she had learned to become more circumspect. Too often she had been shocked and disappointed, too often she had been misled; the memory had not been what she had thought it was. The image would shift and the face would suddenly not be smiling. The child would be both running and crying. The sea would be dark and churning on a stormy windswept day. And this morning, halfway between waking and sleeping, in the misty light of the breaking dawn, the bicycle had been propped against a different wall. It was to be the day that she would remember for the rest of her life, everyone said so; and nothing was to be allowed to spoil it. Having tiptoed across the landing to the bathroom and washed and dressed as quickly and quietly as she could, Christie carefully slid back her bedroom curtains. The sun was shining, the sky was a faultless blue, the seagulls were up and circling high, their cries carried away by the gentlest of breezes coming from the sea. And her bicycle was waiting for her, gleaming against the garden wall. As she went down the stairs, and as each tread creaked loudly enough to wake the whole house, Christie had to fight back an attack of the giggles. It was too ridiculous. Here she was, the day after her twenty-first birthday, and she was creeping around at dawn as if she was thirteen years old again and sneaking out of the house to meet Jenny and go swimming in the sea before breakfast. Still trying to stifle her laughter, Christie pushed open the kitchen door. ‘Oh!’ she said, the laughter vanishing. Her mother was sitting at the kitchen table in her dressing gown, nursing a cup of tea. ‘I don’t know what you’ve got to laugh at,’ she snapped at Christie. Her mother reached across the table for her packet of Consulate. They were so much more refined, she always told people; she wouldn’t be seen dead smoking anything else. ‘Your big day,’ she parroted, her voice heavy with sing-song sarcasm. ‘It is, Mum,’ Christie said quietly, determinedly. Nothing was going to spoil it. Nothing. ‘You’re up early,’ Christie said, trying to move on. ‘No, Mum …’ Christie said. It wasn’t fair, she wasn’t having it. Not today. ‘Yes, Mum,’ her mother said mockingly, refusing to let go. ‘Because I’m marrying Truman?’ Christie said. ‘A highly readable novel with a warm heart’ (Independent on Sunday). LOVE, LOVE ME DO – one traumatic day for Baxter. Click here to buy it now from just £5.99p! They’d had the argument a hundred times; despite herself, she was being sucked into it again. ‘Because of who you are marrying and because of where you are marrying him,’ her mother said, clicking her lighter and sending a billow of smoke in Christie’s direction. ‘I wish you’d change your mind, Mum. You could still come, it’s not too late,’ Christie said. Why was she being so conciliatory, even now? She didn’t want her there. Not if she was going to be like this. ‘To the wedding,’ Christie said. Her mother sat back in her chair and gave Christie a look that said she must have completely taken leave of her senses. She shook her head. Again she put the cigarette to her mouth; this time she let the cloud of smoke rise up from her as she spoke. Apart from christenings and funerals, Christie couldn’t remember the last time her mother had set foot inside a church. It was just an excuse. She didn’t want Christie to be happy; she had never wanted her to be happy. She had waged such a long, bitter war with her husband, and Christie had always been on the side of the enemy. For a moment there was silence between them. Silence was better, Christie thought. It didn’t last long. ‘Anyway, what are you doing up at this time?’ her mother demanded. Her mother took the cigarette from her mouth, rocked back in her chair and laughed throatily. ‘Leave it, Mum,’ Christie said, feeling tears suddenly come to her eyes. She turned from the kitchen and ran to the front door. Some of the memories that had come back to Christie as the weeks passed had seemed to have no part to play in answering the questions that nagged at her. Here she felt her mother’s hard hand for the broken buckle on her new school shoes; there she was being carried shoulder-high by her father along the seafront with an ice-cream cone dripping in her hand; here she was hugging her friends on her last tearful day at school; there she was shivering with nerves in Mr Bonfield’s office on her first day at work. These she had tried not to linger on for too long, however diverting and tempting at least some of them might have been. Others had been almost too difficult to dwell on at all and she had promised herself she would try to return to them again. But as she had worked conscientiously through all these memories, Christie had come to realise that her main preoccupation was to try to understand how each one was connected to the next, how each might have a consequence that would lead it to the next. This, she had told herself, was what she meant by making sense of it. She needed to be able to say to herself, ‘Because this happened, that then happened.’ Because of this, that. But it had been exhausting. And frustrating. And defeating. Her father had once told her a story. Her father had told her so many stories; stories for her alone. Most of his stories, told when she was very small and snuggling in to him only half awake, were of knights and dragons, hope and laughter, where the moral was always that courage and honesty brought their own reward, where dreams could come true. But this much later story, recounted as they walked together along the seafront on a wet November day, was a strangely dispiriting one about a king who had been condemned to spend eternity rolling a stone up a mountainside. She hadn’t thought much of it at the time, although she hadn’t told her father so; she wouldn’t have wanted to disappoint him. But now she felt she understood it because it seemed as if she had been similarly condemned to spend her own eternity of night-time hours picking through all these pictures from her life and trying to join them together. And, just like the king and the stone, she had done this in the knowledge that however hard she might try they could never finally be pieced together. There had been no story of her own where she had done this and so that, then, had followed; where because she had decided that, then this had come about. Instead, there had been all these decisions made about her life that she seemed to have had no part of. There had been so many things that, unknown to her, must have been decided elsewhere, must have happened elsewhere and had then come spilling, crashing into her life. In the end there had been simply too many things that she should have known about her life, her life with Truman, but didn’t. The king’s stone rolled down the mountain once more; everything was broken again into separate pieces. Nothing joined. It made no sense. Lying on the thin mattress of the cramped uncomfortable bed as the early-morning light filtered through the skimpy net curtains, lying there listening to a wood pigeon greeting another day, calling over and over in the distance, Christie, of course, knew exactly how long it had been since she had first set her eyes on the caravan. None the less, as she found herself doing each morning now, she counted through the weeks that had passed. Six weeks, she confirmed to herself as she tried to remember at what point she had truly begun to confront the thought that this was something much more than a holiday. Six weeks. And in all that time she hadn’t found a way to talk to Truman about it, to ask him why they were still there, when they were going home. Six weeks of boiling kettles to wash nappies in a bucket. Of stamping on the wheezing foot pump for cold strip-washes in front of a trickling tap over a sink the size of a saucepan. Of trying to scrub mud and grass stains from clothes that would be stained and muddy again within hours, within minutes. Of juggling pans on a single guttering Calor Gas ring to cook for them all each day. Of skinning her knuckles as she struggled on her knees to put the beds together each night and again as she packed them away every morning. Six weeks of fighting to keep her fraying temper, to keep hold of her sanity, as Megan and Baxter squabbled and whined on those endless days when the rain drummed on the roof and the windows steamed. Six weeks of catching water in a bowl as that rain dripped and ran through the cracked skylight. Six weeks of the baby’s sometimes whimpered, sometimes fierce teething complaints. And they were still in this idiotic caravan. In this hateful forest. Or at least, she and the children were. So he couldn’t help the big grin on his face, could he? It wasn’t a bad life, all things considered, Truman Bird thought, lying propped up on the plump pillows of the soft, ample double bed, drawing contentedly on his first cigarette of the day, watching the heavy smoke curl slowly towards the ceiling as a slender shaft of morning light broke through a crack in the curtains. Thank you for the free books to read – thoroughly enjoyed them all – very good writing style and absorbing characters – began to read love, love me do – and just had to have it on my Kindle. So I bought it. Can’t wait now to read it. Thank you Mark. That’ great, Pat. Hope you enjoy LOVE, LOVE ME DO – and, perhaps, the sequel, IMAGINE. I’m glad you enjoyed the opening chapters of LOVE, LOVE ME DO, Linda. You can order it from any online retailer or through any bookshop. The sequel, IMAGINE, is also now available. Hope you enjoy them both! This is really good. It had me interested right from the start. I’m usually more into history or fantasy but I’d definitely want to read more of this. Each chapter left me wanting to know more. That’s great, Christine.I hope you enjoy the whole book. Mark. Now you have done it ! I thought that Martina Cole was great the way she gave us bites of everybody and you soon got into the story as a whole and you never get bored? Well now you have written this story in the same manner and i am dirt chuffed that I will have author of the same standards and if you can write one every year like she does !OMG think about it..I am talking to a future Millionair,I wish you all the best in the world for your future. Now i shall shut up and go order this great book. Moira, What a wonderful reaction! Thank you so much for this. Please let me know how you enjoy the whole book. Best wishes. Mark. Wonderful, Georgia! People tell me it makes a great holiday read. Mark. Stumbled across this on Facebook and I’m hooked. I love the writing style -sensitivity and recalls so thoughtfully done. Intriguing story and cant wait to read this rest. Will be downloading onto Kindle today. Good luck with your writing. From a Southampton Haysom now living in Worthing …. How wonderful to hear from a Haysom (we’re Swanage Haysoms from long ago) – and so glad you like the writing style. You must let me know what you think when you’ve read it all. Mark. Suckered! I have just bought the book on kindle. I usually like dystopian novels or historical who done its. I doubt if I would ever buy something with love in the title lol. However this story has me hooked. Must go now, can’t wait to get on with this amazing story. By the way I am a 60+granny !! I’d love to hear what you think when you finish it, CH. AF: Purchased on my Kindle!! It is an unputdownable read!!! Loving it!!! CM: I have just read this book on flight to visit my daughter in Dubai (from Ireland). I loved it. But I have to admit I was originally put off by the title and cover. I know, how shallow is that and yes I have often bought a book because I fancy the cover. However I have no problem admitting I was wrong and I have already pre-ordered the follow up. JA: I live in Cyprus. We have fairly good bookstores so will look out for it. CP: Have purchased on my kindle and finding it hard to put down. Great read. CC: Really enjoyed this book!!! Brought back memories of the 60s, with the songs. DB: Interesting. Got me thinking. Family disappears? ? What lies bring told . also why??? Will buy to find out!! TW: Looks gripping. Just ordered it on my Kindle. DH: Think I’m going to have to buy this book too! AR: I really truly wish I could write as well as this!! I want to know what happens next!…therefore, I’ve bought a copy! Mark – you may pat yourself on the back!! PB: So sad. Want to read more. CP: Thanks Mark. Looking forward to reading it. AT: Got to get book. Got me riveted !! How absolutely captivating! Such intrique. I must admit your writing evokes such reaction within me. It is as if I feel each heartbeat, each tear, each emotion. It is an amazing start and now I am going to buy both books. Just love your work.